If you are an inventor, then you have probably already begun the daunting process of looking into getting a patent for your invention. Finding the right patent can become a headache, and the language that is used may be confusing and too much to handle or truly comprehend. It is a good idea to find someone that can take all the guesswork out of the process and help you find the most viable patent opportunities with clear, written proposals. First, you will want to understand what a patent is. A patent is a license that confers a right or title for a set period of time that carries the sole right to exclude anyone else from making, using or selling your invention and idea. The patent is issued by the United States Patent and Trademark Office and is typically good for a term of twenty years from the date of the application. There are several different patents that you will need to know about to decide which would be best for you including utility patents, design patents, and plant patents. A utility patent is for someone that has invented a new and useful process. You need a design patent for a brand new and original design that has never been seen before. A plant patent is for anyone that invents or discovers a new variety of plant. While you can get a patent yourself, without any help, it is recommended that you hire a professional that can help guide you through the process so that you do not miss out on any valuable information, paperwork, or documentation that is involved in the process. A patent consultant is equipped with the knowledge and experience that is needed to help with the legal aspects of obtaining your patent. They may also have the connections you need that you would not otherwise have access to that can even assist you with marketing research and making your product more marketable. Receiving a patent for your invention can be a lengthy and costly process, so it is recommended that you get the help and advice of a professional. They can also help independent inventors gain the attention of established companies. If you choose to get the patent without a professional consultation, there are a few mistakes that can be made during the process, which could also be easily avoided if you had a professional helping you. If you are too vague when it comes to the documentation for your patent, then you are risking losing valuable information about your product and the process you took while inventing it. You should be extremely detailed and thorough when it comes to the documentation concerning your patent. If you do not conduct a patent search, then you are risking your product already being patented by someone else. You need to make sure that there is no current patent on your idea. Checking for an existing patent is commonly overlooked because the inventor feels as if their product is unique, however, there can be several with the same idea or concept. You will also need to make sure that you apply for the patent in time. Once you sell your first product, you only have a year to get the patent. Now if you decide to continue with a patent professional, then many of these mistakes may be corrected and could ultimately even be avoided. Research: They can help verify if the patent is available, help you write a clear proposal, and consult you on the process from start to finish. They can also help you work with top research resources, and even find you double-blind research at group-buy prices. Before filing your patent alone, consider the many benefits you can take advantage of when you consult with an experienced and knowledgeable patent service company. 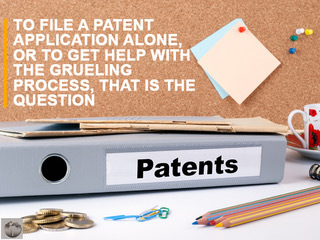 Let us help make the patent process easier on you.